This picture of the Babbitt Welcome sign area epitomizes the incorrigible nature of the “Mine, Log, and Lease the Hell Out of These Lands” crowd. They can not tolerate one dissenting vote without shouting “Dump Otto” from all the bully pulpits of Northeastern Minnesota. The statements made by the mayor of Babbitt at the Tuesday Group meeting in Ely where State Auditor Rebecca Otto spoke (11-26-2013) clearly show the good mayor still does not understand the difference between iron mining and sulfide mining. Anyone who is still locked in the “Jobs, Jobs, Jobs” mindset and is not asking the hard questions, as Rebecca Otto is doing, is only looking at benefits and ignoring the risks of sulfide mining. As auditor of the state of Minnesota, Otto is tasked with evaluating the costs and risks to the taxpayers of Minnesota. And, from the response of the overflowing crowd at Ely Tuesday Group, she is doing what she should be doing, doing it well, and we are thankful she is willing to shoulder the burdens of these hard questions. Most politicians in Minnesota are acting as if the numerous severe risks and potential costs to taxpayers are trivial. Otto is the first Minnesota state official to stand up and say we should have a long hard look at the cost to Minnesota taxpayers with non-ferrous (sulfide) mining. Click here to see the complete video of Rebecca Otto’s talk in Ely. For any conscientious individual, maybe one with a bit of critical thinking ability, Rebecca Otto’s stance is the ONLY logical and practical stance for a person with her responsibility and for the well being of Minnesota. The extreme mining reactionaries are so far from any truth on this matter they should be ashamed of themselves. However, shame is not an emotion they know and truth about mining is not something they even want to think about. I’ve only found them boldly confident in their “MINE THE HELL OUT OF THESE LANDS” position. 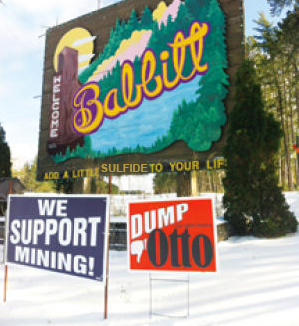 The above sign should read…KEEP OTTO –DUMP POLYMET!!! State Auditor Rebecca Otto brought common ground to the sulfide-mining debate in Ely in late November when she drew attention to the enormous risk all of us face as taxpayers. What are the tax benefits of sulfide mining? Not even our governor seems to be certain of that. Otto said the governor has tasked the Department of Natural Resources to learn more. Let’s hope that happens fast because the long-awaited Supplemental Draft Environmental Impact Statement has now been released that could lead to the permitting of Minnesota’s first copper-nickel mine, an industry the Environmental Protection Agency has pegged as one of the nation’s most polluting. The scary question is: What is the potential cost to taxpayers? Otto said her key concern is that nobody seems to have a fix on that yet. A Barr Engineering report prepared for the proposed PolyMet mine gives us all a chance to do some back-of-the-napkin figuring. PolyMet acknowledges its mine wastes would generate pollution for 500 years. Its long-term treatment plan calls for two reverse-osmosis plants. The Barr report indicates these plants would cost about $20 million each to build and $2 million each per year to operate over a 20-year lifespan. If both plants ran 500 years, operation and replacement costs would total $2.8 billion. That $2.8 billion is just a portion of the true cost of a site generating polluted water for centuries. The Barr report on PolyMet’s water treatment doesn’t include monitoring expenses and disregards future escalating costs. It does suggest a contingency cost should be included (for technical failures, clean-up of seepage, etc.). So the final tab is likely to be many times the $2.8 billion. (Water-quality scientists with the Grand Portage tribe calculate PolyMet clean-up at $90 billion.) The $2.8 billion expense just to keep pollution treatment online is about five times the projected cost of developing PolyMet and close to the total projected value of the copper to be mined. And what about the 300 jobs PolyMet suggests we’ll get in return? Even under the rosiest scenario, total mine payroll over 20 years would be a small fraction of the $2.8 billion cost of treating pollution for 500 years. Who is going to pay that $2.8 billion? It hardly seems likely that the $150 million financial assurance bond PolyMet has proposed would even come close. Because PolyMet has no assets other than the mine, if the deep-pocket parent company is not included on the permits, Minnesota will have no access to assets other than an abandoned, polluted mine site. Glencore Xstrata, PolyMet’s “strategic partner,” owns nearly a third of the company’s stock and the first five years of metals if PolyMet is permitted. Glencore is a multibillion-dollar Swiss corporation chaired by former BP CEO Tony Hayward, whose environmental record is infamous around the world. The corporation stands to profit if PolyMet is permitted; shouldn’t it also be responsible for the cost of cleaning up the mess left behind if things go wrong? If PolyMet walks away, Minnesota taxpayers would be saddled with the aftermath virtually forever. As the ancient Greeks said, “A society grows great when people plant trees whose shade they know they’ll never sit in.” What does that say about a society that plans industries that we know will poison our lakes and streams virtually in perpetuity? Let’s hope we have more to go on than a back-of-napkin cost-benefit analysis before Minnesota considers permitting an industrial activity that’ll generate pollution for centuries. Otto’s pro-taxpayer position on this issue is one around which we can all unite. We need more financial transparency on this issue — and fast. Otherwise our grandkids will be left wondering why we let foreign mining investors take such huge advantage of “Minnesota nice” at the expense of countless generations to come.